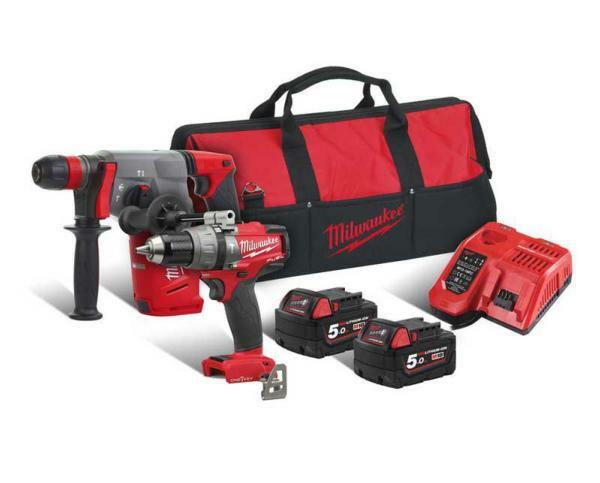 The Milwaukee M18ONEPP2N-502B is a versatile kit consisting of the M18CHX-0 Fuel SDS+ Hammer, the M18ONEPD-0 One key percussion drill, 2 x 5.0Ah batteries and charger all held together in a Milwaukee Bag. What is the One key Feature? The One Key system enables you to sync up your tool via bluetooth to the app available on your phone (ios and android). Once this is set up you are able to configure your tool for repeat precision with up to four custom settings on your tools memory, these can be from the pre set options or customise your own for specific jobs that you may be doing. You are able to keep a record of all the tools you have , save receipts, track the repair history and view notifications for the recommended maintenance due for your tools. If you misplace your tool it has built in tracking within a maximum distance of your phone to enable you to locate it again. What is Red Lithium Ion battery? The difference between a standard lithium battery pack and the red lithium technology is they provide total system communication with overload protection to increase the life of your tool. The built in fuel gauge displays the remaining charge left on your battery so you know how much work you can expect to get before needing to change batteries over.